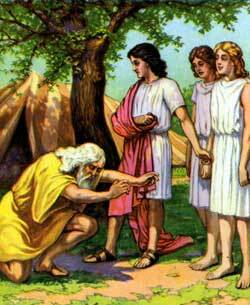 Abraham's visitors tell him that Sodom will be destroyed. T WAS NOONDAY, and everywhere the sun shone hot upon the plains. But Abraham sat in the cool shade of his tent door, beneath a tree. Presently three strange men drew near. They did not look like other men, and Abraham knew they were from a far country. He hurried to meet them, and, bowing low toward the ground just as he always when greeting a friend or a visitor, he urged them to rest for a while in the cool shade. This they were quite ready to do. "Shall I hide from Abraham this thing which I do"? the Lord asked his companions. "I know that he will teach his children to keep my ways and to do right." Then, turning toward Abraham the Lord said, "I am going to visit Sodom and Gomorrah to see if these cities are as wicked as they seem, for the cry of their sins has reached me." The two men hurried on; but Abraham detained the Lord a while longer, because he wanted to talk to him. He knew the Lord would destroy the cities if he found them to be as wicked as they seemed, and he thought of Lot. Now, we remember that Lot had gone back to live again in Sodom after Abraham and his servants had rescued him and his family from the enemy's camp. Abraham knew that Lot too might perish if the cities should be destroyed. And he loved Lot. He wished once more to try to save him, so he said, "Will you destroy the righteous persons in the city, will you not spare the lives of all for their sake'?" And the Lord promised to spare Sodom if he could find fifty righteous persons in it. Abraham feared that there might be less than fifty. And he was troubled for Lot's safety. So he spoke again. "I know that I am but a common man, made of dust," said he, "yet I speak to the Lord. If there should be only forty-five righteous persons living in Sodom, will you spare the city ?" And the Lord said he would spare the city for the sake of only forty-five righteous persons. Still Abraham felt troubled. He feared there might not be even forty-five. So he asked if the city might be spared for the sake of forty. The Lord knew it was Abraham's love for the people which to plead so earnestly for Sodom, and he promised to spare the city for the sake of forty. "What," thought poor, distressed Abraham, "if there should not be even forty righteous persons found in Sodom?" And once more he spoke. "0 Lord, be not angry with me," he said, "but if there are only thirty righteous persons, will you spare the city for their sakes. And the Lord promised to spare the entire city if only thirty people could be found in it. Abraham continued to plead until he had asked the Lord if he would spare the city if only ten righteous persons were found, and the Lord promised to spare Sodom if he could find only ten. Then the Lord passed on, and Abraham returned to his tent.